"Sons of Gondor, of Rohan, my brothers. I see in your eyes the same fear that would take the heart of me. A day may come when the courage of men fails, when we forsake our friends and break all bonds of fellowship, but it is not this day. An hour of wolves and shattered shields, when the age of men comes crashing down, but it is not this day. This day we fight! For all that you hold dear on this good Earth, I bid you stand, Men of the West!" The Return of the King. What needs to be said as anyone reading this has almost undoubtedly seen the film in theaters. Finishing up Peter Jackson's take on J.R.R. Tolkien’s masterpiece that is the Lord of the Rings, The Return of the King brings us back to Middle Earth, with Frodo, Sam and Gollum continuing their journey to Mount Doom to destroy the Ring. If the ridiculous amount of awards has taught us anything, The Return of the King is a solid film, creating a trilogy that holds up throughout, a rarity in Hollywood. Nevertheless, is the film really that much better then its predecessors to be bestowed so highly by the Academy? Probably not; but lets face it, the three films were shot simultaneously, they look and feel the same; if audiences could sit down for 12 hours at a time, the entire trilogy could easily be seen as one film. Thus, I believe the awards can be accredited to the fact that this is an epic trilogy in itself, with masterful direction and all the elements that make great films, well great. While the film ends somewhat unevenly, with multiple fade to blacks to finish off individual storylines, the Return of the King is a more then worthy finish to the Lord of The Rings trilogy. But, you've already seen the film, so let's talk DVD. Presented in 2.35:1 anamorphic widescreen (there is a full screen version....don't ask me why), and much like previous LOTR releases, New Line has created yet another reference quality disc. Detail is exceptional, colors are vibrant, darks and blacks are extremely rich and bold. Flesh tones look great and I noticed no edge enhancement problems. What more can you ask for; this is a fantastic presentation. As for audio, again like previous non-extended LOTR releases, we get a very active Dolby Digital Surround EX mix. Overall, this is an excellent mix, with great bass presence throughout almost all of the film. Clarity and fidelity is outstanding, and surround use is active and enveloping. Reference quality. An English 2.0 track is also included, as well as English and Spanish subtitles. As for extras, this is not the everything-and-the-kitchen-sink extended version. Rather, this set contains mostly promotional material that die-hard fans have probably already seen. But, for those that just enjoyed the film and don't need 40 hours of Return of the King, this set does contain a decent selection of extras. Starting it out we have, "A Filmmaker's Journey: Making The Return of the King." This TV special comes in at just under 30 minutes and contains a bit on the LOTR storyline, Jackson's desire to direct the trilogy, and some cast and crew commentary. Focusing more on Jackson and his filmmaking style is "The Quest Fulfilled: A Director's Vision," coming in at just over 20 minutes. 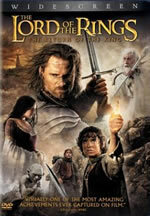 Finishing off the TV specials is the far meatier "Beyond the Movie: The Lord of the Rings - The Return of the King." This feature focuses mostly on Tolkien and the characters, settings, and battles he has created in the Lord of the Rings series. By far the most interesting of the extras. Rounding out the extras we have six little featurettes that were available at the Lord of the Rings website, two theatrical trailers, and 14 TV-Spots. For those that don't need the huge extended edition coming up on the horizon, this is a solid DVD release of Return of the King. Reference quality audio and video and a selection of extras that should be enough for those that don't need every last bit of LOTR info. For the rest of us, wait for the extended edition.